Step inside the taxis of Sofia for a glimpse into the wild heart of Bulgaria. Twist in the passenger seat as drivers have awkward encounters with drunks, thugs, cheating spouses and the suicidal. Witness the rescue of a stray dog or stray human. Watch drivers fall in love with the wrong person, or the right one. Experience a good passenger, or a bad one. Find an excellent driver, or a heartless one. The stories of joy and pain are inspired by real events and conversations with drivers. 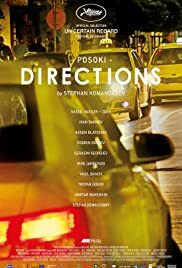 Directions provides a fascinating look inside Bulgarian life as well as the human heart. The camera work was done pretty much all at once and was handed from one car to another, which adds urgency to each scene and heightens the tension. "This required lots of rehearsals," said the director at the Toronto International Film Festival. He maintains to be an optimist at heart, because "the others have left Bulgaria." One aim of the film is to "provoke discussion, which is the first step for a clear view of reality." The film is authentic and gripping. It flows well from one scene to the next, like you really have a seat in each of the cabs. There are great twists and turns as the film goes in different directions. The film first surfaced at Cannes. 43 of 46 people found this review helpful. Was this review helpful to you?